Nintendo Wiki has an article on Joy-Con. The left and right Joy-Con. The Joy-Con is a controller for use with the Nintendo Switch console. Like the Wii U GamePad, the Joy-Con have near field communication functionality, specifically the right Joy-Con, allowing the use of amiibo with games. Additionally, the Joy-Con are equipped with "HD Rumble", a more advanced form of haptic feedback to replicate the feel of in-game activities. The Joy-Con are unique in that they can be used as controllers regardless of whether or not they are physically connected to the Nintendo Switch. They can be connected to the Nintendo Switch itself when in Handheld Mode, forming something similar to the Wii U GamePad. 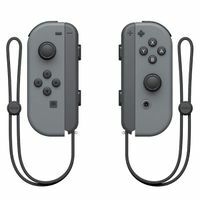 They can also be disconnected from the Switch in Handheld or Docked Mode, functioning as wireless motion controllers; they can also be optionally be placed in the Joy-Con Grip, emulating the feel of a game controller. The left and right Joy-Con function as a pair in all of the aforementioned modes, but one can also use a single Joy-Con as a controller by holding it sideways. The Joy-Con controllers attached to the Nintendo Switch. This page was last edited on February 19, 2019, at 02:58.